Where do Asian Americans Stand on Affirmative Action? The U.S. Supreme Court affirmed the ability of universities to attain the educational benefits of diversity by implementing race-based affirmative action programs, but narrowly tailored it to apply only when no workable race-neutral alternatives would produce the educational benefits of diversity. 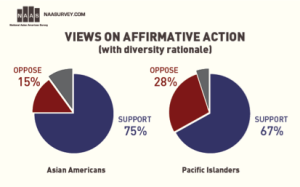 Where do Asian Americans and Pacific Islanders stand on the issue of Affirmative Action? In our 2012 National Asian American Survey, we asked “Do you favor or oppose affirmative action programs designed to help blacks, women, and other minorities get better jobs and education?” This was modeled after a question asked by the Pew Research Center in July 2002. One quarter of our respondents got asked that question (Version 1). Do you favor or oppose affirmative action programs designed to help blacks, women, and other minorities get better jobs and education? In order to promote diversity, do you favor or oppose affirmative action programs designed to help blacks, women, and other minorities get better jobs and education? As the results indicate, Asian Americans and Pacific Islanders both overwhelmingly support affirmative action programs (by a margin of 76-14 and 65-22, respectively). And these high levels of support are not dependent on the introduction of rationales for promoting diversity. Finally, we replicated these two versions, but without any mention of the term “affirmative action,” to see if just the use of the term provokes resistance among Asian Americans and Pacific Islanders. Among Asian Americans, levels of support were highest when the affirmative action label was dropped (rising from 76% to 81%) and the effects for Pacific Islanders was even greater, with support levels rising from 65% to 79%. Levels of support were the same, regardless of whether or not the diversity rationale was mentioned. Note: These results are based on interviews 4,269 interviews of Asian Americans and 486 interviews of Pacific Islanders from July 31, 2012 through October 21, 2012. Our prior reports on issues affecting AAPIS from September 2012 were based on 3,042 interviews of Asian Americans and 342 interviews of Pacific Islanders from July 31, 2012 through September 19, 2012.